The era of gene retirement. As of 2015, the list of epilepsy genes has shrunk by one. EFHC1, a gene initially proposed to be a monogenic cause of Juvenile Myoclonic Epilepsy, is no longer an epilepsy gene. A recent study in Epilepsia finds that EFHC1 variants initially thought to be pathogenic are found in unaffected controls of the same ancestry. Follow us on one of the most perplexing journeys that modern day neurogenetics has to offer, and the retirement of the first epilepsy gene. Clarification. I am writing this post, realizing that I am offering a very strong opinion on a presumed candidate gene that many scientists have worked on and that has been thought to be causative for monogenic epilepsies ever since the initial discovery by Suzuki and collaborators in 2004, which was published in Nature Genetics. I am aware that this blog post, discussing the finding by Subaran and collaborators, which were also discussed in a commentary by Deb Pal and me, may raise controversy. This is why I would like to emphasize that while I use phrases such as “gene retirement” and “false positive”, I am not implying that there was any lack of scientific rigor when describing EFHC1 and suggesting its role in epilepsy. I would like to emphasize that I hold the work done on EFHC1 in very high respect and do not mean to be dismissive. At the time, the data supporting EFHC1 was as good as it could be. However, as we will discuss in the next few paragraphs, this gene was swept away by genomic noise. Study by Subaran et al. To get to this point straight from the beginning: the study by Subaran and collaborators does not prove that EFHC1 is not an epilepsy gene. There is no study in the world that could accomplish that. However, the authors raise considerable doubt about the pathogenicity of some of the variants that were previously implicated as pathogenic. The study by Subaran and collaborators large focuses on the R221H variant, which was initially found to segregate with the phenotype of Juvenile Myoclonic Epilepsy (JME) in two families. The authors sequenced the EFHC1 gene in different ethnicities and were struck by the fact that they identified the allegedly pathogenic mutation in one Hispanic and two African American controls already in a small cohort of 60 controls. They went on and looked at specific frequencies of this variant in control databases. They found that the EFHC1 P77T-R221H haplotype is present in up to 8% of unphenotyped West African ancestry populations. A haplotype is the linked combination of genetic markers in close proximity. This frequency of up to 8% is much, much more than you would expect for an allegedly causative variant in a monogenic epilepsy. The authors leave us with two different choices on how to interpret this data: (1) either, this variant is causative in one, but tolerated in other populations or (2) this variant is not pathogenic at all. Given the variability of the human genome that we have come to appreciate, (2) may be the more likely explanation. Other concerns. EFHC1 has always been an outsider amongst the epilepsy genes. It is not an ion channel gene and even though EFHC1-deficient animals showed some propensity for seizures, the expression in brain was questionable. However, these were “soft” concerns that did not really call the role of EFHC1 into question. More recently, EFHC1 has been found as a highly variable gene in the human population, a gene that tends to “tolerate” functional mutations in the overall population, which is in contrast to many other epilepsy genes such as SCN1A. 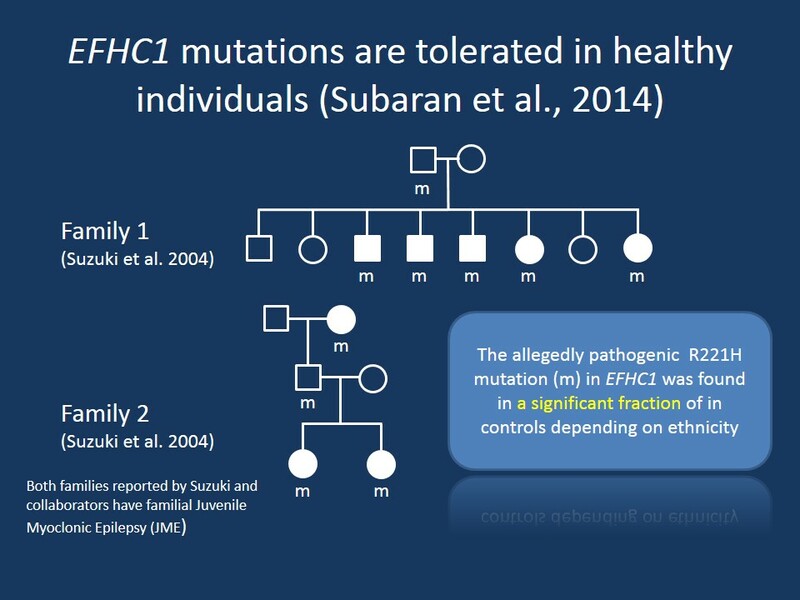 EFHC1 seems to be naturally variable and therefore prone to collect rare variants that may seem intriguing in family studies at first glance. EFHC1 was part of the “chromosome 6 saga”, the long-lasting hunt for gene for Juvenile Myoclonic Epilepsy on chromosome 6 that was suggested by several linkage studies. However, also this story does not seem to hold in 2015. Large association studies do not find any significant association in this region. In defense of EFHC1. The data by Subaran and collaborators make us question the role of EFHC1 in human epilepsies and make us re-assess all secondary findings arising from this initial study. For example, the interpretation of EFHC1 as the causative gene for a recessive epileptic encephalopathy was highly dependent on the certainty of EFHC1 as an epilepsy gene. Now also this finding may have to be reconsidered alongside its inclusion in OMIM. In defense of EFHC1, however, not all variants found in families have been found to be present in controls. While the suspicion is high that also these variants may simply be unrelated rare variants, there is some more work to be done to make this case as clear as possible. How to handle false positive findings. As we discussed in our commentary in Epilepsia, the real winner of the EFHC1 story is the scientific method. The role of EFHC1 was questioned again and again using different paradigms and types studies. We did not take the role of this gene for granted, but actively searched for additional sources of evidence. As a community, we can be glad that we are capable of accepting and tolerating such earthquakes, which destroy parts of what we consider our knowledgebase. The EFHC1 story reminds us that there are various other genes, which are often taken for granted as causative genes, but which may also require a closer look. These genes, including CACNA1H, GABRD, ME2, and BRD2 are still frequently referred to as causative genes for human epilepsies, but may require a similar reassessment. This entry was posted in 2015, Epilepsiome, Epileptic encephalopathy, Publications and tagged BRD2, CACNA1H, EFHC1, EFHC2, EMX2, exome fallacy, false positive, GABRD, GWAS, ME2, population stratification, R221H, rare variants, SCN1A, SCN2A. Bookmark the permalink. ‘The era of gene retirement’ Love it!